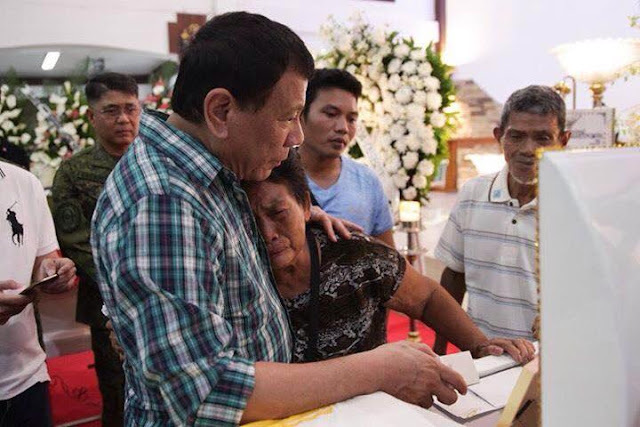 GUIHULNGAN CITY, Negros Oriental July 28 -- President Rodrigo Duterte condoled with the families of six slain policemen here on Thursday, July 27, following an ambush by the New People's Army (NPA). The President awarded the slain lawmen the Medalya ng Kadakilaan and extended their families with financial assistance. President Duterte promised to provide for the education of the children and employment for the widows. Aside from the assistance extended by the Philippine National Police and the Department of Social Welfare and Development, the President said his office will give additional livelihood assistance. Among those who were killed in the police operation include SPO2 Nacasio Pasculado Tabilon, PO3 Teovic Gador Agosto, PO2 Alvin Paul Alquizola Bulandres, PO2 Alfredo Lastimoso Dunque, SPO1 Jesael Ancheta and P/Supt. Arnel Arpon. The policemen were ambushed by around 60 members of the NPA as they responded to request by a city councilor for police assistance last July 21. The attack happened around 9:50 a.m. in Brgy. Magsaysay in Guihulngan City, in Negros Oriental. The police force suffered casualties because of overwhelming number of enemy and superior firepower. President Duterte then proceeded to Dumaguete City to visit the policemen who were wounded during the attack by the insurgents. The Chief Executive personally checked the condition of SPO4 Jerome C. Delara, PO3 Jordan B. Balderas, and PO2 Jorie R. Maribao who are confined at the Siliman University Medical Center. He pinned each police officer the Medalya ng Sugatang Magiting or the PNP Wounded Personnel Medal.